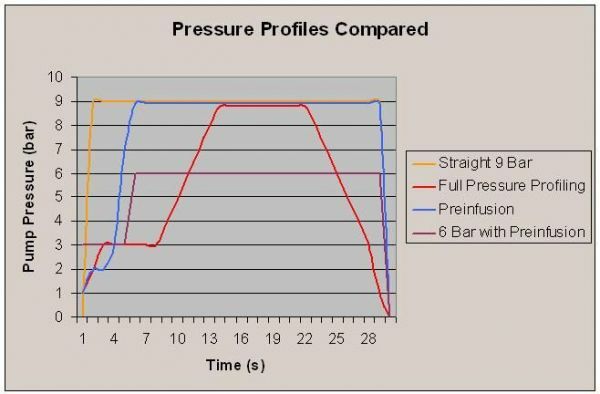 Pressure profiling has been all the buz since 2010. What is it? Essentially it is the ability to apply different pressures to the espresso pump, and hence to the coffee. Typically commercial espresso machines run at 9 bar (your tyres are typically around 2 bar). 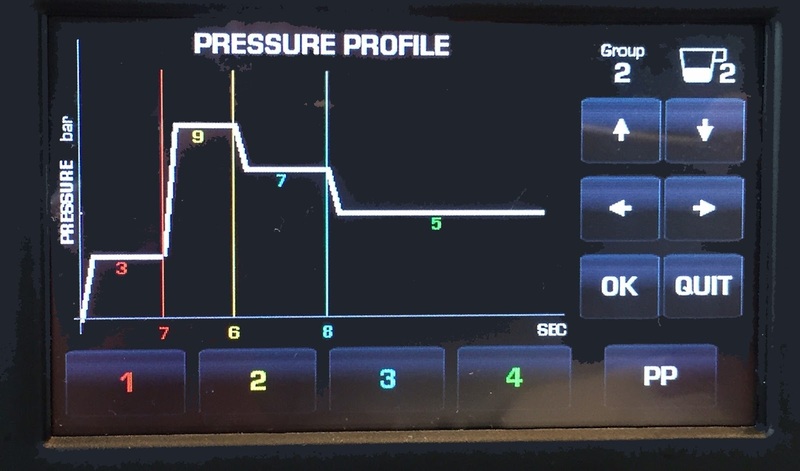 A pressure profile machine is able to change pressure during the brew depending on the barista's requirement, or whoever sets up the machine. One thing worth nothing It does appear that it can be used to facilitate extraction of particularly lighter roasted coffees, since the pressure at particular stages in the brew can affect how soluble the grinds become, or how well you extract the coffee. First contact is very important. Too much pressure causes channelling (for those American people this is spelt with a single "l" for some reason), which results in uneven extraction. Too little pressure for too short a time cause extraction to be delayed. So for the pre-brew 2-4 bar is recommended. For how long is the debate and dependent on grind and coffee, however a range of between 4-9 seconds seems to be a good place to start. Remember that during pre-brew / pre-infusion no coffee pours out of the machine. The pre-brew is essentially allowing the coffee to swell and take enough water to be at its best to extract coffee. The aim of the pre-brew done is to limit the migration of fines. If they migrate too much they end up at the bottom of the basket which slows the flow, and makes the coffee bitter. The longer the pre-infusion (to a point) the faster the flow rate. A recommend recipe of 20g puck is 8 seconds at 2 bar. We found for a 18g puck 2 bar needed about 8 seconds, and 4 bar needed about 7 seconds. If the pre-infusion is successful the flow of water through the cake or puck will be controlled. By controlled we mean it will flow gently then slowly accelerate. This is worth considering when setting the pressure at this point. After the pre-brew pressure is increased, to the maximum for the brew and normally held there for a few seconds at full pressure. Once again reduction of channelling is the aim, increasing extract of the essential characteristics of the coffee. Too long at this pressure the stream will run to fast, especially if the pre-brew was long. We used 9 bar at 5-7 seconds, for our one coffee. Final phase is to ramp down leading to the end of extraction. Since the puck density has decreased significantly at this point, the rule of thumb is: the longer the ramp up at the beginning of extraction, the more dramatic the decrease in pressure should be now. If the flow is accelerated too much then the pressure is too high. You want the flow to still be controlled, but perhaps a little faster then it was at Stage 2. Too much flow destroys the good work in extracting the characteristics of the coffee. It does appear that the type of basket you use can cause varying results. So try a few including the factory fitted one. 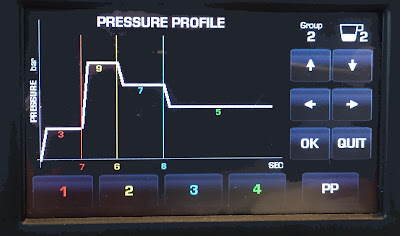 Having spent a bit of time setting pressure profiling up, this is a very valuable tool. If you know what you want out of your coffee, getting it is possible with various grind sizes and doses. The control you have over how the water extracts the flavours and body from the coffee is quite an experience. Since water is different everywhere this sort of control really opens the world of coffee up in ways that are almost hard to fathom.